I am a psychic medium. I don’t actually see spirit with my actual eyes. I see them in my third eye. I can feel, sense, know, and hear them. I have had this gift ever since I was child. For a long time I was known as the lucky person. Then at age 40 I began to think how lucky can one person be? Why am I also so lucky? Why do I just wake up knowing that something great is going to happen? Why did I suddenly get out of a car and then 20 minutes later the person driving the car gets into an accident? Why do I have anxiety or paniac attacks right before someone I know or love is about to get hurt? Why do I always feel like a higher being is protecting me? I always feel safe no matter what. Why did I walk away scratch free from an accident when my friend was severely injured? Why did my car stop within a centimeter of the car in front of me? How did I possibly avoid hitting that car in front of me when there was no where to go? Where did that bright shining light come from that is now beaming brightly on the road when I am driving down the road in a terrible blizzard just praying to god that I make it hope safely. Why do I know so much about a person I’ve never met before. Why do I feel like I know someone and we are great friends when we have never met before? I had way too many questions that needed to be answered so I set sail for a journery that would later change my life. I began to study and learn everything and anything that I could. Everytime I took a class I found out I can do that. Then I took the next class and sure enough I could do that. I was a natural. How could I possibly pick up a pair of keys and starting knowing everything about someone I never met? How can I look at a photo and obtain so much information? Why am I suddenly hearing this song in my head and I can’t get rid of it? Why did I suddenly drive somewhere and the harder I try to drive away the more I get pulled back to that same spot. I learned later in life that spirits brings you to place to help others or give them messages. At the time, it doesn’t make any sense to you. I once had to live with 2 weeks of intensive head, neck, and back pain. When I went to the massage place, my pain suddenly stopped. You see I was called there to help a grieving person and to give her a message. So I gave her the message and I suddenly felt better. 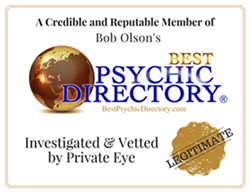 When I was 21 years old, I had my first vivid psychic premotion. I was laying bed and was awoke by what I thought was a horrible dream. I was dreaming that my “Nonie” which is grandma in Italian, was laying in bed yelling out to my Aunt Karyl for help. She said, “Karyl” very faintly. Then, she yelled her name again. I clearly saw my Aunt Karyl eating her breakfast, doing a word puzzle, and listening to the early Sunday morning news when my Nonie called her name. She finally looked up and saw that she needed help. She ran towards her yelling Ma are you ok? When she got closer she knew she needed help. Nonie told her to call an ambulance but on this particular day the ambulance number which had been written on a board next to the telephone suddenly disappeared. To this day we still don’t know what happened to the ambulance phone number. Anyway. My Aunt Karyl calls my mother for help. It was at this point, in the dream that I suddenly woke up. I was sweating like a pig and my heart was beating so fast, I thought it was going to jump right out of my body. What I saw in my dream seemed so vivid. It was almost as though I had turned on the tv and was watching a show. I couldn’t shake this horrible feeling. I got up. I got dressed and drove to my Nonies house. When I got their, my car doors mysteriously froze. They were locked and no matter how hard I tried to unlock the car doors, I could not. My head started to feel light headed. I felt like I was going to pass out. I kept looking at the clock but the clock wasn’t moving. It was as though I was in a time warp. I finally pulled myself together and I was able to back up the car and head home. I took off as fast as I could and head for home for help. When I got there, I went running up our driveway. My dad came outside and stopped me. He said, “Hold on there. What’s the big rush.” I went charging past him and into the house where I saw my mom. I said hurry up, Aunt Karyl needs help. Nonie is having a heart attack. My mom said what? Almost immediatley the phone rang. I said hurry up get that. It’s Aunt Karyl. She can’t remember the ambulance number. My mom said well it’s written next to the phone. I said, “I know that hurry up and get the phone.” Sure enough it was my Aunt who explained to my mom what had happened. My mom hung up and stood their for a minute looking at me. My dad said, “What?” My mom replied that was Karyl, mom is having a heart attack and we need to take her to the hosiptal. For a split moment, my mom just stood there. I started to yell at her. Hurry up don’t just stand their you don’t have much time. My mom just looked at me and said, “How did you know?” I said I don’t know, now move it. Faster. Faster. I kept yelling at her pushing her out the door. When my mom got to the end of our driveway, I knew it was too late. My Nonie was about to pass any minute. About an hour later my parents came back from the hospital. My dad said, “I have something to tell you.” I said, “I know.” “She died.” He looked at me and said your mother told you? I said no. I just knew. To this day, we still don’t talk about that day in my house. This is a picture of me and my sister. She is the one who opened my eyes and encouraged me to use my gifts. In the photo, you will see a back brace, it was through my own sisters car accident that I learned I was healer and could help people by moving the energy around, praying, and doing energy healing work.